Shimano has discontinued the Kozuka NT rods. Replacement parts will be available for the next 4-5 years. The Shimano Kozuka NT rods are somewhat similar to the Daiwa Kiyose SF series. Both are light weight rods that collapse to a short length, fitting easily into a modest daypack. Both are thus excellent choices for backpackers. There are some interesting differences, however. Perhaps the most significant difference is that the Shimano Kozuka is not as stiff as the Daiwa Kiyose. It is still plenty stiff enough for fishing heavy nymphs and I think it would be a better all-around rod for tenkara fishing. 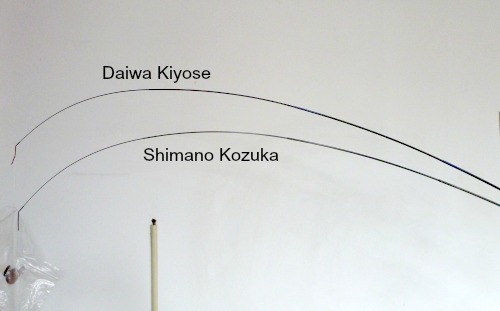 It is a keiryu rod, as is the Daiwa Kiyose, but it is not quite as stiff over the full length of the rod as either the Yamame or the Amago (further proof that the line between tenkara rods and keiryu rods is blurred). The Kozuka 39NT is a 33 penny rod, compared to 30 for the Yamame and 31 for the Amago. Also, the tip sections are not nearly as soft as on the Yamame or the Amago, making the Kozuka 39NT a better nymphing rod than either of the two tenkara rods. If you like soft 5:5 tenkara rods, the Kozuka is not for you. If you prefer a crisp 7:3 action, though, you may really like this rod. In addition to being a bit softer than the Kiyose, it also collapses to a shorter length - just 14.75" - which is shorter than any other rod I've found. The Kozuka rods doweigh a bit more, although the entire weight difference is due to the larger rod cap on the Kozuka. The rod cap has a built in line holder. I'm not sure how useful it is for a tenkara angler. It cannot be used for furled lines because they are too thick. Also, because the length of the line holder is only about 3", it puts a lot of kinks in a level line. You can easily rid the line of kinks with a little stretching, though, and for backpackers who want the simplest possible solution, this may be it. For anglers who will use a keiryu rig, with a line of 5X and tippet of 6X, though, it is quite useful. The tippet material won't kink as much as tenkara line does, and the weighted nymph or split shot will pull the line straight in any event. The grip is a bit different than the grips found on most of the other keiryu and seiryu rods I've seen. Most use a rough surface to produce a nonskid grip. The Shimano, on the other hand, is smooth to the touch but is still an effective nonskid surface, even when wet. After having fished with a number of keiryu and seiryu rods, I now prefer their grips to the cork grips of tenkara rods. Based on the emails I get from satisfied rod owners, I'm not the only one who feels that way. The narrower grip does feel a bit strange at first, but there are now a lot of tenkara anglers who have not only gotten used to it, they do not want to go back to the width (or the expense) of cork. 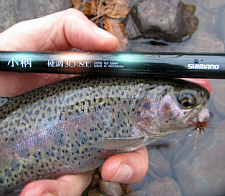 The thicker grips and heavier weight of most tenkara rods make them feel, well, "clunky" is the word I hear most. As with all the Japanese rods I've seen, other than perhaps the inexpensive Soyokaze and Kiyotaki rods, the finish on the rod is beautiful. The photo below really does not do the rod justice. As with the Daiwa and Nissin rods, you really do have to see it in the sunlight. One of the main features that I had highlighted for the Daiwa Kiyose, and now for the Shimano Kozuka, is the compact size when collapsed. Their usefulness as backpacking rods is obvious. What I hadn't highlighted, and what I hate to admit I didn't even think of until it was pointed out to me, is their usefulness as travel rods. 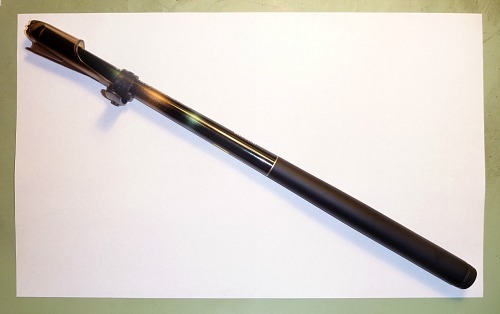 The photo below shows the Shimano Kozuka on a legal size sheet of paper. This rod will fit in any carry-on. For that matter, it will fit in any briefcase! How many vacation spots have water nearby? (The ones that don't is a shorter list.) Whether you are on vacation, on a business trip or just visiting family, there's probably some place not too far away to wet a line if you can get away for even just a couple hours. One of the great things about tenkara is that besides your rod, your line, a spool of tippet, and a tiny fly box with perhaps a dozen or so flies, there's really nothing else that you need. This may be the ultimate travel rod. And if you travel to places where there are fish like this, then this is the rod for you. Even if you're not really "traveling" but just getting together with a couple friends for a weekend away, the Shimano Kozuka goes where you go. The following video shows an angler fishing with a Kozuka for the first time. The the Shimano Kozuka does quite nicely with a size 4 fluorocarbon tenkara line and 5X tippet, or a 5X keiryu line and 6X tippet. I went out with the Kozuka 30NT last evening for the first time. I have to say, it far exceeded my expectations - not sure what those expectations were, but I really like the rod. I had a 9'3" Iwana handle that I used one time and didn't like it at all. The difference in the Kozuka 30 and the fairly similar in length 9'3" Iwana is night and day. I used a 10' furled leader and 2' of 6x tippet using a Goddard caddis as an indicator over a killer bug or kebari. It cast the furled line perfectly and handling the fish was a lot of fun. Got a couple of nice trout (photo attached) and a dace. 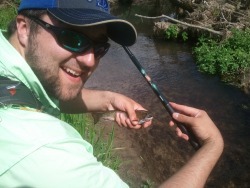 Last week I took my good friend Mike to one of the more secluded brook trout streams we have here in Iowa, he just purchased his first Tenkara rod before we left for this outing. To say he landed a few brookies on his new rod would be an understatement, I have attached a photo of him displaying one the brook trout he caught with the Shimano rod he purchased. Fished a mainstem stream today with the Shimano Kozuka 39 and it was a many and big fish day. A slew of bows from 14 to 20 inches quite a few other large ones lost too. Moderate to fast pocket water. If they get downstream on that pocket water they are pretty much lost. The Kozuka handled them with aplomb though. I was using a 14’ #4 with about 3-5’ of 5x. Actually the rod is quite amazing in controlling large fish and casts real smooth too. I also landed quite a few wild browns from 14 to 16 inches that put up a good fight. And then a couple of mighty chubs about 8 to 10 inches long. Caught all of the fish on either a black Killer Bugger or a brown Killer Kebari. Just got back from a mt bike trip in Colorado where the Shimano Kozuka spared the life of several freeze dried dinners.